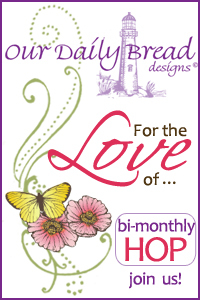 Welcome to the Our Daily Bread Designs Alumni Team bi-monthly hop, this weeks hop theme is For the Love of Love, Lace and Friendship! I'm the start of the hop this week, a complete list of those participating in the hop can be found the ODBD Blog. You'll want to be sure to visit and comment on all the participating designers blogs, because one of them is a hop hot spot and a name will be drawn from that blogs comments to win a $15 ODBD gift certificate towards stamps. You have until Wednesday, January 29th at 6PM EST to leave comments. Inspired the this weeks Mojo Monday Sketch and this weeks hop theme, I used Our Daily Bread Designs Friends stamp set along with pattern paper from My Minds Eye Ruby Collection. I stamped the saying in Black Archival on Vanilla card stock and die cut using Spellbinders Petite Oval Dies, layering on a Black Oval. All panels are sponged with Ranger Gathered Twigs Distress Ink. To embellish I added a piece of Crochet Lace, Mini Roses and a Jet Black Crystal Flourish (CRB-05CB0114) from Zva Creative. Your next stop on the hop is Connie's Blog! A beautiful card Lisa with a very true and special quote!! Love your addition of the pearls, lace and flowers to frame it as well as the black which makes the sentiment pop. Beautiful card, layout and saying! Love the scallop and bling. I'm not a big fan of the song but I do like this card! Nice color combination. this is such a sweet and serene card. beautiful. The colors on this card are very pretty and it seems to have an art noveau feel to it. So pretty, I love the flowers with the touch of lace. Beautiful card! Love the sentiment and the lovely way you framed it with this oval die cut and the gorgeous bling and posies! Beautiful! I love the swirls and flowers. Great message delievered to a friend who recieves your card. love the swirls. Very nice and I like seeing an example from Mojo Monday's sketch. Simply adorable Lisa! Love this pretty design! Very pretty Lisa! Love the bling and gorgeous flowers, and the color combo is so pretty! A very beautiful card Lisa! Love your card, Lis!!! I LOVE when you use this stamp!! Beautiful papers and love the sketch! HUGS!! Love the black framing and pearls Lisa!! It really makes that quote pop!! so sweet, love the big scallop border and your touch of lace with the flowers! Very nice...like the black border and pearls. Very, very pretty Lisa. The black really sets everything off nicely! Love the flowers! The Mojo sketch is a great one, and your interpretation is fabulous. You picked wonderful colors, and I like the sentiment! Great layout and love the black pearl flourish! Great job! Love the card and the sentiment. LOVE IT!! That is the perfect sentiment for you gorgeous card! Very beautiful card. I love the stamp you chose. I love your pink & black distressed card + bing! Love this card especially the pretty white doilly and the lace leaves. Wonderful. Wow Lisa...what a beautiful card...i just oove those black rhinestones running along the one side of your card...what a way to frame an awesome! What a great combination of colors and style! Love it! Love the verse. The black flourish accent and three little roses look so nice and brings out the little rose on the designer paper. Very pretty card! Your card is absolutely lovely. I think that the upper left hand quadrant DSP is superbly vintage and that brings to mind true friendship. Very stylish and a fabulous crystal flourish. Thank you for sharing with us at Simon Says Stamp and Show! Sarah. Beautiful...love the papers & the bling! Lovely card! The design is beautiful! I love the gem flourish! Beautiful card! I love the soft colors with the black accents. Great sentiment! Very pretty--I like the sketch you used and the embellishments. Beautiful card, and that sentiment you chose is so touching. Would love to have that in my stamping stash. Such a pretty card Lisa! Love the details! Such a beautiful card, thank you for sharing your creation. 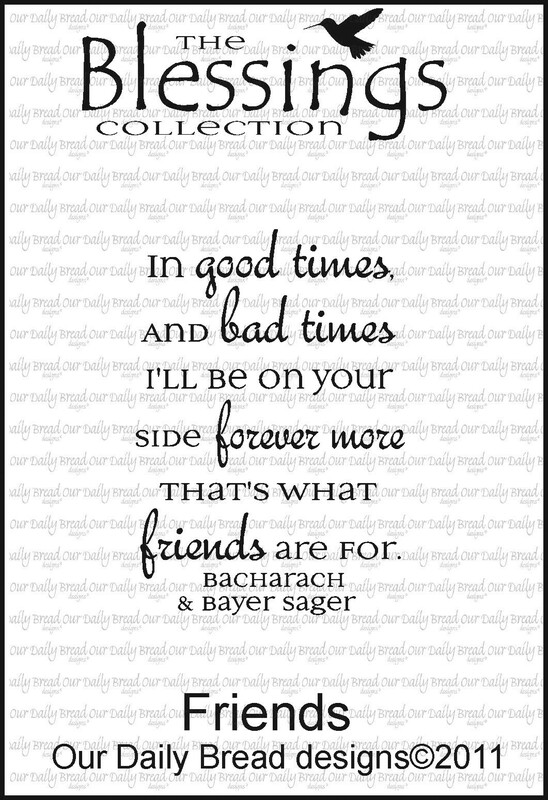 The saying about friends is one that hits very close to home. Myself and some of my best friends have been going thru some of the worst times in our lives, but knowing that we have God & friends in our lives makes each day much easier. Cute card, I like your layout & use of black to frame the layers. Nice sentiment, didn't know that was from ODBD, cool.